In the map there are three different areas of the park and the relative existing restrictions for each of the them. The area of the marine park is 14,4 square km, 89,2 square km of sea, 31,2 square km of peripheral area. Many info points are located in the Gulf of Laganas and the rangers in charge are both guardians and guides of the protected areas. Zakynthos Marine Park is a no profit institution and for its good functioning it counts on the indispensable contribution of the tourist in respecting the rules. The marine park is a first and innovative step towards nature and ichthyic environment preservation in Greece; Zanteisland.com thanks in advance the tourist for his co-operation. 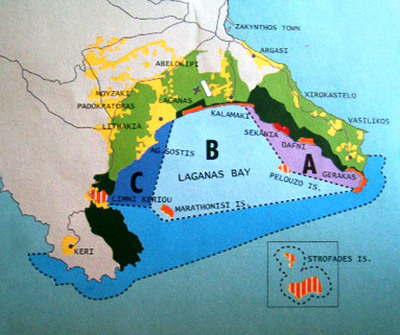 All those prohibitions are listed in the brochures that are distributed at the entrances of the protected beaches from some volunteers of the National Marine Park of Zakynthos so that the tourist is aware about how to behave in those areas that are so important for the turtles’ breeding. It is thanks to those rules that it is possible to admire the turtles in their own natural habitat.